A good value two course lunch can be found amongst the ubiquity on the high street in Chiswick. Off on a little side street, Fish hook specialises in ... well, do we really have to spell it out for you? £12.50 gets you two courses from a set menu (there's a non-fishy option for each course too). These photos highlight a main course Londonist had recently: fish and chips. 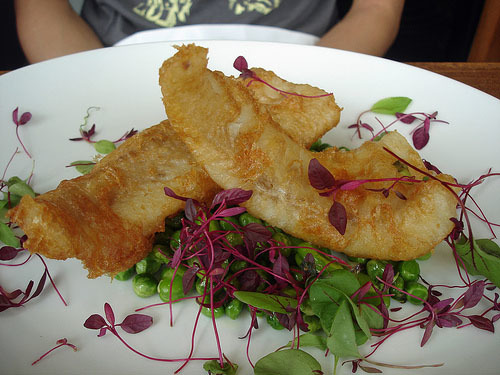 The haddock was battered and fried to a light crisp and sat on top of peas and broad beans. 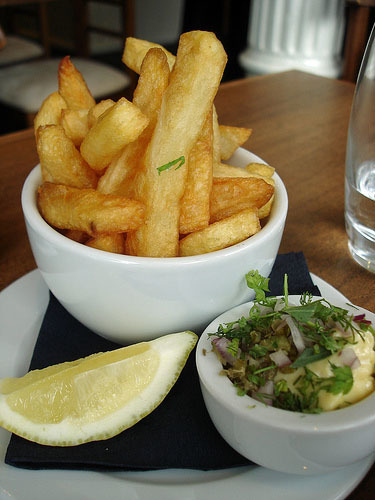 The chips on the side were fine specimens and the tartar sauce was a fun mix-it-yourself version. Everything was fresh and the main course is generously portioned (the starter is much smaller) making the two course set meal good value.